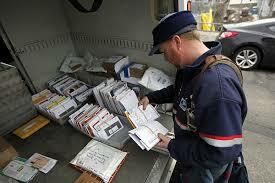 USPS | How A Letter Travels OR How Does My Mail Carrier Know Where I Am? How A Letter Travels OR How Does My Mail Carrier Know Where I Am? In discussing with a customer the USPS Move Update requirements, she was curious how the letter carrier knows to take the letter to her house even though the address is wrong. Here at Strahm Automation we use several processes to meet Move Update compliance. Some customers choose NCOA as a pre-printing step – saving them printing and postage on addresses that may not ultimately make it into a mailbox. As well, they get reporting back of updated addresses and addresses that are just flat out “bad”. Many presort only customers choose Move Comply as their update method. This process takes place at the presort level. Our MLOCR sorters bounce the address on the envelope against a USPS database and spray the correct barcode onto the envelope. Back to Mary and her question of how the carrier knows exactly where to deliver her mail, this informative piece from the USPS gives a great overview of how a letter travels through the mail stream. I hope you find it enjoyable! This entry was posted on January 22, 2015, 8:37 am and is filed under Mail, Thursday Blogs!, USPS. You can follow any responses to this entry through RSS 2.0. You can leave a response, or trackback from your own site.